This sweater is adapted from The Complete Book of the Flower Fairies, by Cicely Mary Barke. Her illustrations of different flowers represented as fairies is so charming. I can't recall which flowers these fairies are, of course. There is a river of water streaming past grey stones at the bottom of each scene. There is a red fairy on the front, a purple/blue fairy on the back, and orange and lilac fairies on the sleeves. A very small lace pattern circles the hem below the red stars on green trim. The wrists and neck have a picot edge. So, seriously, I didn't like Frog and Toad at all when we first read them to our children. Anthropomorphized animals, I dismissed. But repeated listening exposed the amazing subtleties to the stories and the absolute sweetness of the characters. 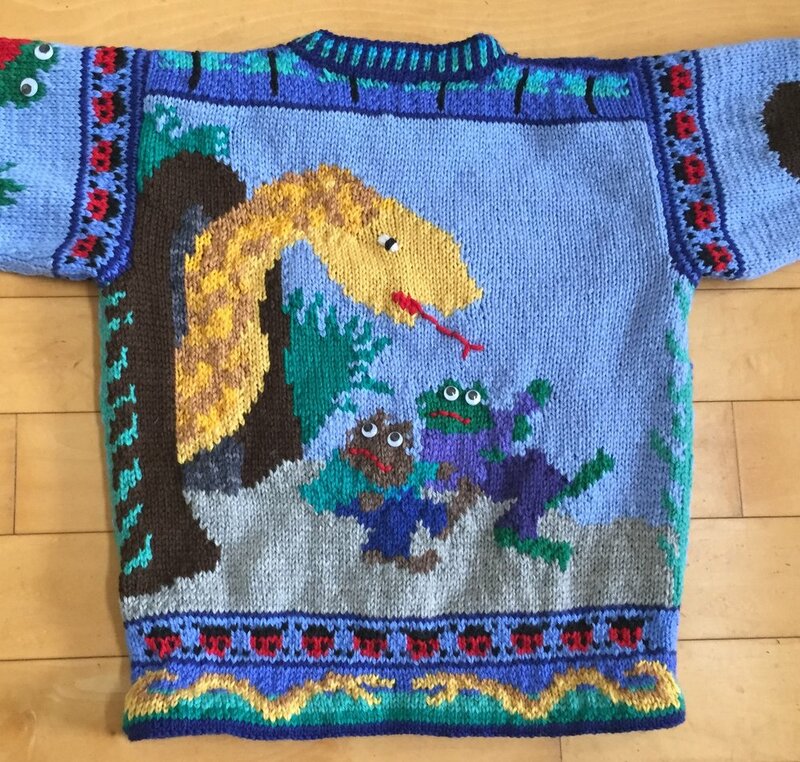 This sweater represents four of those stories that will be familiar to any Frog and Toad lover: flying the kite, fleeing from the snake, bringing the ice cream cones, and finding the lost button. I love the golden snake on green and blue trim pattern - and there are the ladybugs again! Turquoise dragonflies cross the shoulders and the ladybugs reappear at the top of the sleeves. 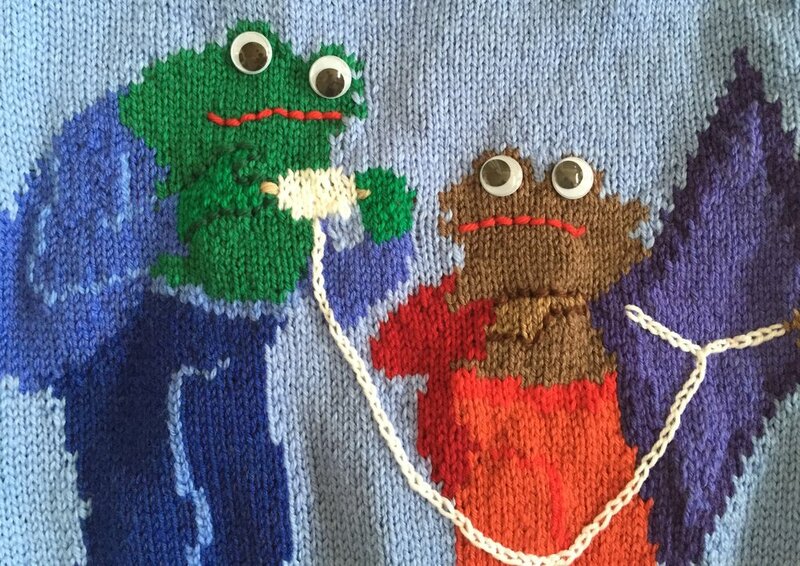 Frog and Toad have sewn-on eyes and sewn-on mouths. If anyone has a method of applying thin, seamless embroidered mouths, please show me! Is Halloween as big a holiday for children now as it was when I was young in the 60's and 70's? We went out with pillowcases, with no adult supervision, and brought back a huge treasure of candy. It was harder for our children, living in rural areas. We finally realized we could go to nearby Chatham, which was relatively crowded and festive, and they finally got to experience something close to what Leif and I experienced when we were young. So here on the front are a ghost and a witch; on the back are a princess and a pirate; on the sleeves are a cat and pumpkin and a ghost floating out of a house. Red irregular flowers on green circle the wrists and hem, with picot edging and lace. The neck has dark green picot trim. This is based on the Inchworm song, measuring the marigolds. The front and the back are identical. There are two clay pots of marigolds in shades of orange. Across the hem is a ruler, with the bright green inchworms squiggling across. There is also a hem pattern of dark green leaves on dark orange. The neck and armhole openings are periwinkle picot trim. This is an adaptation of a Jirina sweater inspired by the Moomintroll books by Tove Jansson. On the front are Moomintroll and the Snork Maiden standing before the observatory, with the golden comet in the sky. On the back Moomintroll, Snufkin, and Sniff are climbing the mountain toward the observatory. The right sleeve is Moomintroll and a horse on the beach. The left sleeve is Moomintroll and Snufkin on a bridge. The neck, wrists, and hem trim is arches in green, red, and blue. There is a smaller version of this in the One Year sweaters. Originally I made a Nessies sweater for Jirina (in the Family Sweaters). This is a better version, with more detail and a lovely lighted castle on the rocky shore of Loch Ness. Bright red Nessies with gold spikes swim in the blue waters. 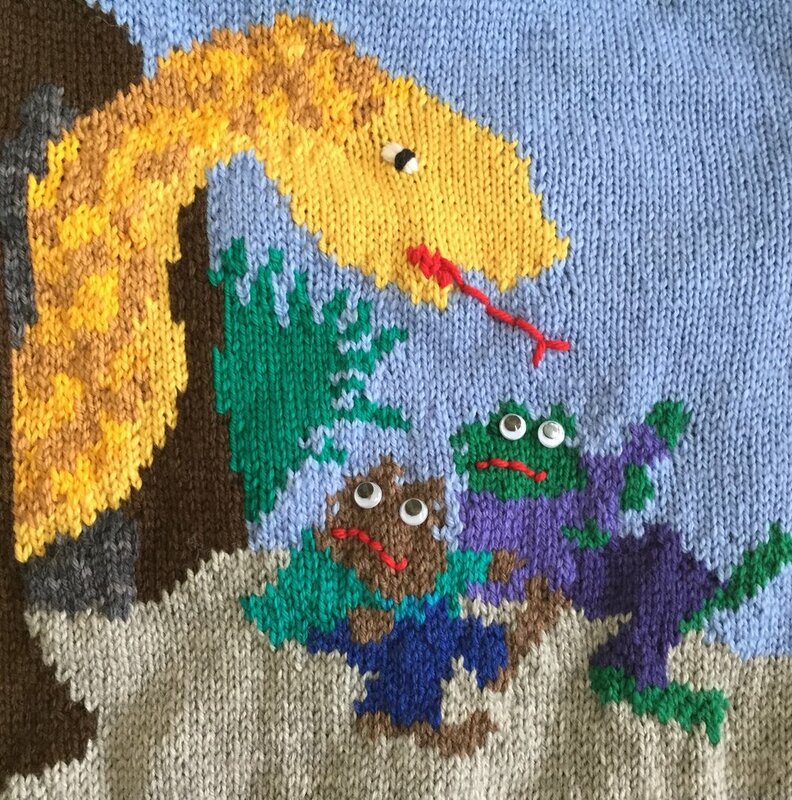 Are there really three Nessies? The neck and armhole openings have simple dark blue ribbing. The hem is modified triangles with bells at the points. When Levin was young, he dictated a story to me about Magic Rocket. 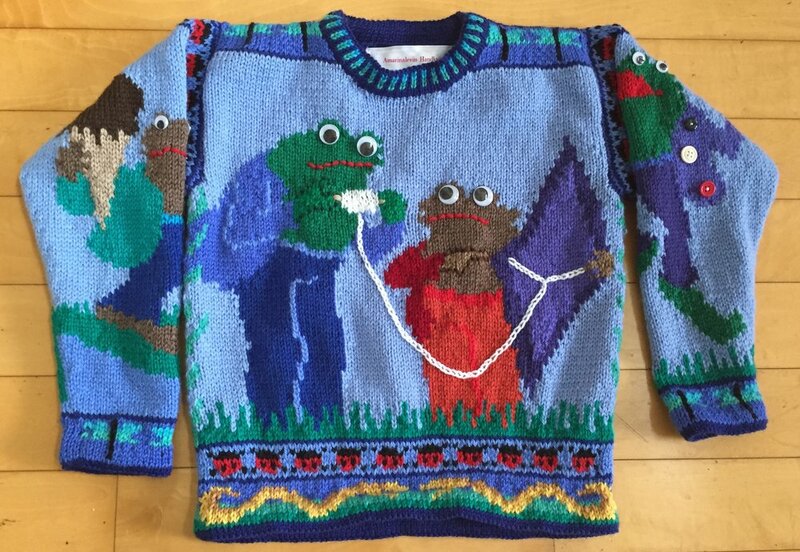 That is the inspiration for this sweater. On the front the rocket is soaring into space past the Sun, Earth, Mercury, Venus, and the Moon. On the back are the outer planets, in incorrect order!, in a starry sky. The sleeves are mirrored comets shooting through the starry sky. The wrists and hem trim is rocket flames against the blue sky. The neck, wrists, and hem trim is alternating stripes of red and variegated blue. 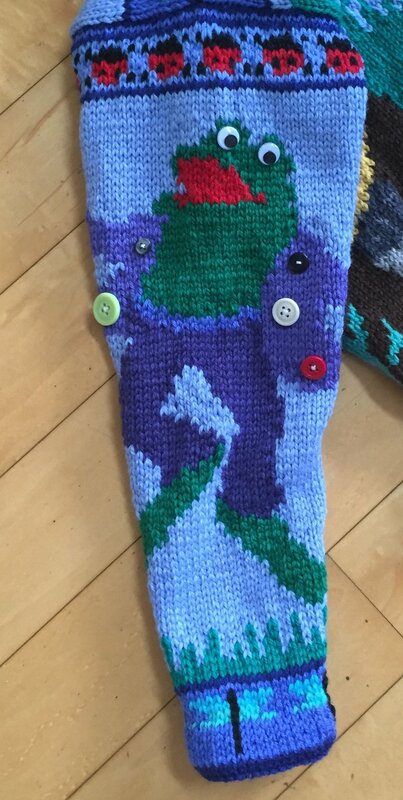 There is chain stitch detailing around the planets and the rocket. This is a sweater that demands patience, and the shape of the rocket really has to be completed with the chain stitch. When our children were at our Waldorf school, they experienced many new festivals I never heard about growing up. One was Saint Nicholas day, when the children would be given golden walnuts in their shoes. Another was a visit from Saint Lucia, when a lucky girl in fifth grade, maybe, would get to visit each classroom with glowing candles. Advent was also memorable, when the very youngest children were allowed to walk a candlelit evergreen spiral. Levin didn't go to school until first grade, but one year he very proudly joined in. This sweater depicts Saint Nicholas and his helper Peter placing toys in childrens' shoes. A fire in the fireplace wraps around the sweater, with holly decorating the mantel. Paintings are also hung on the green walls. On the identical sleeves, a window is decorated with more holly. A trim pattern of holly leaves and berries circles the wrists and hem. The neck, wrists, and hem also have a trim pattern of shades or green alternating with red. Okay, I think you've all got it. Have I literally made Totoros in every size?